"This exciting game is filled with betrayal, alliances, and surprise attacks. On the battlefield, anything goes! …. The player who completes his or her secret mission first—and reveals the Secret Mission card to prove it - wins. And remember... when it comes to taking over the world, it’s all about who is willing to take the biggest Risk." – from the description of Risk, the Game of Strategic Conquest, from toy manufacturer Hasbro's website. 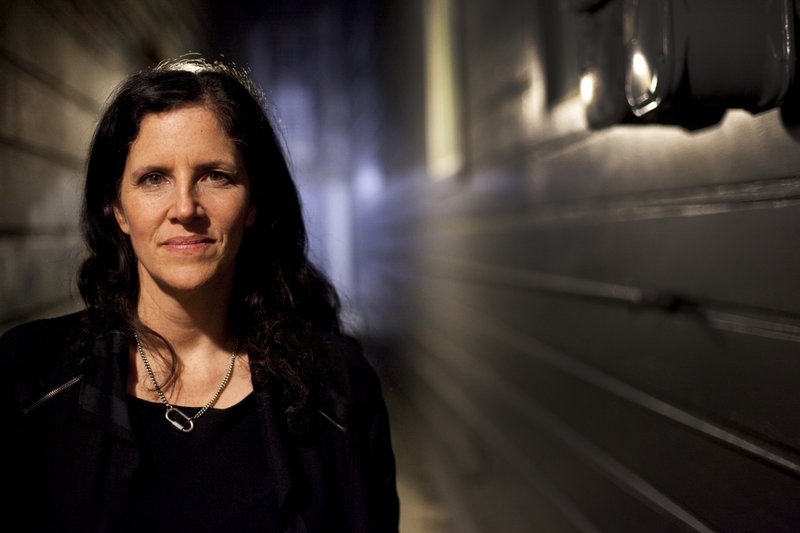 The above description of the board game Risk, coincidentally created by Oscar-winning French documentary filmmaker Albert Lamorisse (Le Vent des amoureux), speaks directly to the subject matter of Oscar-winning filmmaker Laura Poitras' new film of the same name on Wikileaks founder Julian Assange. Poitras' Risk is not so much about Assange, but more a film about the making of a film about Assange. "I think the film's title, Risk, is pretty much about everyone in the film," Poitras explains. "That includes Julian, Jake [Appelbaum, who worked for/with Assange], Sarah [Harrison, Assange's closest advisor/sometimes girlfriend], Ed [Snowden], Chelsea [née Bradley, Manning] and me. The word 'risk' kind of applies across the board and is a theme that ripples across the film. Julian's line, 'If you're not fighting for the things you believe in, then you're losing,' is an interesting philosophical concept in that if you're not acting, then that is a risk in and of itself." The 53-year-old Poitras, a MacArthur Fellow, was on a path to create a trilogy about the world, post-9/11. The first two installments were My Country, My Country (2006), in which she embedded herself with an Iraqi doctor running for office in the country's first democratic election following the 2003 US invasion; and The Oath (2010), which told the tale of two brothers-in-law - one, a professed jihadist-turned-taxi driver in Yemen, and the other, a former driver for Osama bin Laden, who was appealing his imprisonment at Guantanamo Bay prison. After the second film was done, she announced that the third installment would be about the 9/11 trials. But she switched gears after Wikileaks, by way of whistle-blower Chelsea Manning, released its Collateral Murder video in 2010, depicting the 2007 US Apache attack helicopter attack in Baghdad that left two Reuters reporters dead; Poitras decided then to turn her attention to the nascent organization and its leader. "I reached out to Julian and Wikileaks in the aftermath of the publication of the Collateral Murder video," she says. "For me, I had been really feeling a sense of dire distress about the state of our media, … and its failure to cover these issues in terms of what the United States government was doing overseas, in war, etc. So when Wikileaks and Manning documented this, it was like we finally got to see what this government is doing; finally, we have aggressive and adversarial reporting; and finally, we are getting a window into the dark realities of US foreign policy. "There was a sense that this was really important and brave journalism - which I still believe," Poitras continues. "I think people can have different opinions about Wikileaks and Julian, but you really can't argue against [the fact that] what they do is very, very brave. So I went into it like that." But, as Poitras' voiceover states in Risk: "This is not the film I thought I was making. I thought I could ignore the contradictions. I thought they were not part of the story. I was wrong. They're becoming the story." When asked about these contradictions, Poitras explains, "I guess the contradictions were between an ideological view of changing the world and issues around what I was seeing around interpersonal relationships. In the film, this gets distilled around the question of gender and sexual politics. I wanted to film them doing journalism, but at that time their submission system was down and what they were doing was fighting the extradition requests for Julian to go to Sweden as part of the sexual assault allegations. So as much as that was not the story I wanted to tell - I actually wasn't trying to dive into that story - that was what was happening." However, her attention to that story was suddenly diverted when a roll of the dice delivered another whistleblower, Edward Snowden, to her virtual doorstep, and made her a reluctant part of an even larger story. "When I began filming, I was really kind of an observer of Wikileaks," Poitras reflects. "The film opens when they're calling Hillary Clinton's State Department, and they're in a really stressful situation with these unredacted cables about to come out and they were trying to navigate what to do. And I was there, holding my camera, thinking, 'This isn't my problem,' in the sense that I was an outsider. But then once I was contacted by Ed Snowden, I was pulled in and [I was] grappling with these questions... and they did become my problem." And part of that problem for Poitras became the stress of whom she could trust, including Assange. "I think you're going to have those questions about trust in any kind of high-stakes situation, and this was a high-stakes situation," she asserts. "There is a massive investigation on Julian - I'm also on watch lists - so we're all very hyper-attuned to 'Can I trust you?' Then there's also a compartmentalization of information. I didn't tell Julian then about Ed for two reasons: one, if this is an entrapment effort by the FBI, for instance, to create a source and go through a documentary filmmaker to get to somebody else, that would be very interesting. So I'm not going to tell him because, I thought, that would be playing into whatever this entrapment is. But then, if it wasn't an entrapment, I have to protect a source. Why would I ever tell Julian that I was in touch with a source, because I know Julian is one of the most surveilled people on the planet? But then, that could also be experienced by Julian as a kind of betrayal. So what I'm interested in, and hope that the film conveys, are all those kinds of levels of drama, betrayal, power and how they unfolded...and unraveled." At this point, Poitras thought she was still making a single movie. "It was always going to be a film about surveillance," she says. "But then it was clear that one film couldn't contain both of these narratives. It was just too much for one film." So the Snowden material became her multi-award-winning 2014 documentary, Citizenfour. Yet she still felt she needed to give the Assange story its own platform, so she went back to working on that footage. 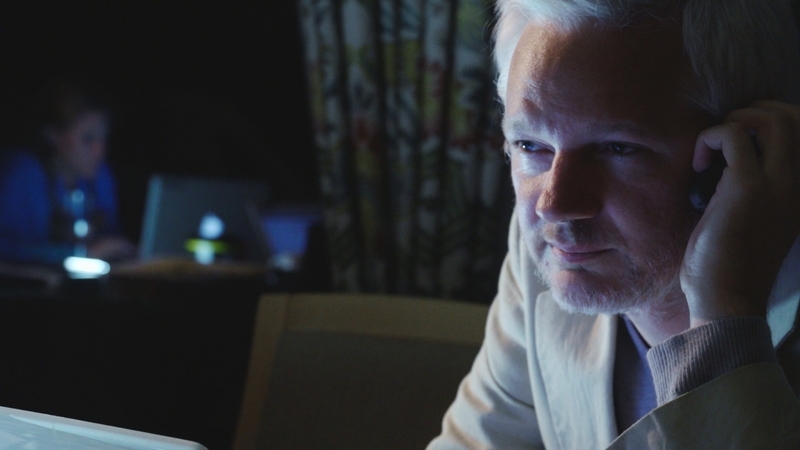 "I always felt that how Julian understood and anticipated this new era of journalism, how the Internet would impact global politics, and his role in that, never stopped fascinating me," Poitras maintains. "So I felt compelled to return to it because I was able to capture somebody who I think is a significant historical figure. I think people are going to look back at this moment and say, 'Well, Julian understood a lot of things before a lot of us did in terms of how the Internet worked, how it was going to change journalism, and setting up this new era of large leaks and what they mean.'" So she went back to the editing room, and a version first appeared in 2015 as a work-in-progress that she screened at the New York Film Festival under the title Asylum. Poitras showcased three episodes of what would be a series of mini-episodes on Assange, released on, and in collaboration with, The Intercept website, on which she had partnered with Glenn Greenwald and Jeremy Scahill. But by early 2016, Poitras had rethought the project. She now believed she had a finished feature film, which she premiered at the Cannes Film Festival in May, even though Assange had now been thrust back onto the front pages with Wikileaks' release of the Hillary Clinton emails a month earlier. Then in June, a series of sexual allegations against Wikileaks journalist Jacob Appelbaum was revealed on the Internet. Appelbaum is featured prominently in Risk and, as Poitras herself reveals towards the end of the film, she and Appelbaum were "involved briefly in 2014. And after I ended things, he was abusive to someone close to me." Because of these allegations, she felt compelled to withdraw Risk and re-edit it one more time. "It was really returning to this question of how to incorporate the questions around gender and allegations of abuse that drove me to go back to the film after Cannes," Poitras explains. "And once I could figure out how to address that, which was necessary for the film, then, obviously, all the news broke about the election, which then also allowed me, from a structural perspective, to give the film a final act....and I use this word 'dystopian' - this really dark chapter in US history in many different ways." But perhaps the hardest thing for Poitras in putting the film out there was revealing so much of herself. As a public figure, she has been notably shy and reticent. A 2013 Rolling Stone magazine article dubbed her "intensely paranoid," and a 2016 interview in the Village Voice called her "famously private." With all the various US government agencies spying on her, however, paranoia is not entirely accurate. Yet in Risk, Poitras not only reveals information about her relationship with one of her film's subjects, but, through excerpts from her journals, she also shares her thoughts, dreams and nightmares. "Yes, it's not my default position to want to put myself in my films," she admits, "but there was a moment when Snowden and I were first contacting each other, and I was journaling about it. I just knew that there was going to be a change in terms of my privacy in lots of ways - in terms of attention from governments, but also in a public way, which is not something I embraced or relished. But I also realized I'd become part of this story and I needed to address it. And in particular with Risk, it was important because once these new sets of allegations came forward involving Jake [Appelbaum], I knew I needed to disclose personal things. It felt like an obligation to do that. What I also wanted to do was not be a narration voice that is an 'after the fact' voice of authority, but to choose things I was writing and thinking about in the time I was shooting those particular scenes. "Risk is a complicated film and what I wanted to communicate to the audience is that I experienced those complications too," Poitras concludes. "So as you're watching it and you're having conflicting thoughts, emotions and feelings, I wanted to echo those feelings as to be a guide to the film. I wanted to key the viewer into the fact that everything happening was also unfolding before my eyes, which both underlined the risks and the stakes that were happening." Risk opens in theaters May 5 through Neon and will air on Showtime this summer. Ron Deutsch is a contributing editor with Documentary Magazine. He has written for many publications including National Geographic, Wired, San Francisco Weekly and The Austin American-Statesman. He is currently developing a new documentary project in collaboration with the Center for New American Media.